When people ask me how I am doing these days, I often will simply say, “It’s March!” To me, that says it all. March is one of the busiest times of the year for me. Not only are all of the wonderful routines and learning activities going on everyday at Rose Park, but I have the privilege of meeting new families who have enrolled for next year through a series of evening conversations over multiple nights. I my first 6 of them Tuesday night. These conversations are exciting to me! There are new families, some with, but many without former ties to HC or RP. Some are former students (always so fun). Still others heard of us through their neighbors, coworkers, and other word of mouth settings. They have seen billboards. Some have been impressed by the move to offer Spanish Immersion. Their reasons for coming are varied, but in the end, they are so impressed with the people they know connected to RP and HC, as well as through direct interaction with our staff at our Discovery Night and tours I host. In other words, they heard about us through you! And are they ever excited to come and join us at RP! There is an energy and eager anticipation that has been so encouraging and inspiring to me in these conversations. Rose Park Fun Night is TONIGHT Friday, March 8! Do you know anyone still weighing their options for educating their child next year? Do you know of anyone curious about Spanish Immersion, specifically? 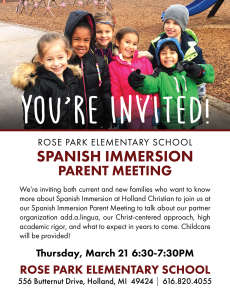 Whether you are a current Spanish Immersion family or not, but especially if you are already in the program, please invite someone to come on Thursday, March 21, 6:30-7:30PM to interact with our current Spanish Immersion families and teachers, and learn more about this program as part of the exciting options available at Rose Park. Please invite someone and join us! Join the Living Hope Singers for an evening of song and dance as they celebrate music from the 1970’s. Showcase 2019 will be held on Friday and Saturday, March 15 & 16 at 7:00 pm in the Holland Christian High School Auditorium. Tickets can be ordered here. Since the MS and HS Parent Teacher Conferences are complete, Virtual Paragon has been reopened. If you haven’t signed up for conferences before, you can now. Signups will be open until Monday morning, March 25. Go to HC Virtual Paragon – our conference reservation system. “Holland Christian’s Master Password” is gohc (all lowercase). Login with an account you created previously or create an account by clicking the “Create New User Name” button. Select all of the teachers with whom you want conferences, by clicking the box next to each teacher’s name. Be sure you have the correct teacher in the correct building since many of our teachers work in more than one building. Press “SAVE/DONE” button when you are finished making all of your reservations. 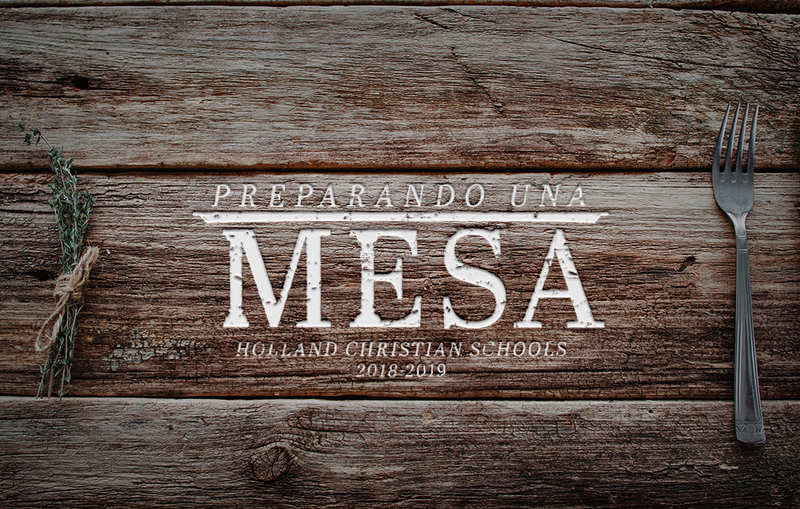 Holland Christian Summer Camps registration is now open! Register today to start building an engaging summer for your child. Our camps are active, hands-on, and Christ-centered. We’ll guide campers to explore new things while they learn about God’s amazing world! We’ve got everything from “Broadway Bound” and “Survivorish” to the more traditional “Volleyball” and other sports camps, all of which are taught by experienced staff. Questions? Call Leanne at 616-820-2811. Our final ski club date for this year is tonight, March 8. Don’t miss this must-see concert on Saturday, March 23, at 7:00 p.m. in the HCHS auditorium. The evening will feature both the HHS and HCHS jazz ensembles, as well as Rodney Whitaker and friends with vocalist Rockelle Fortin. Tickets are $10 for adults, $5 for students. Purchase your tickets at the door or purchase your tickets at this link.! MOMS IN PRAYER- What is MIP? It’s just a group of Moms that scripturally pray together on Friday mornings in our library from 8:15-9:05. We pray the entire time and you know what? Time flies! And it’s so refreshing to Praise our great God, Confess silently and come clean, give Thanksgiving for His many good gifts and answered prayers, and lift up Supplication or requests for our concerns, especially for kids! All Moms are welcome to sit in and just listen anytime. Jesus, I pray that ________ will want to serve You, follow You and be where You are. Kirk is excited to be running his middle school camp again this summer! Kirk has designed his camp to be about building character and having fun while enjoying the game of football. The camp will be held at Hope College on June 28 & 29. Kirk and his dad will also be speaking at a dad’s/guardian lunch on June 29. 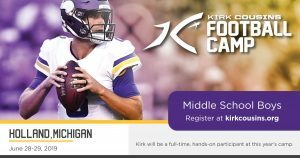 You can register at kirkcousins.org.